Above: Celebrity Silhouette's bow is practically in Old San Juan. Above: Azamara Journey at the Pan American terminal. According to the government of Puerto Rico: "Puerto Rico is the cruise capital of the Caribbean, with the Port of San Juan being the largest cruise port in the Western Hemisphere." There are some 500 cruise ship calls each year with more than a million people going through San Juan's cruise facilities. 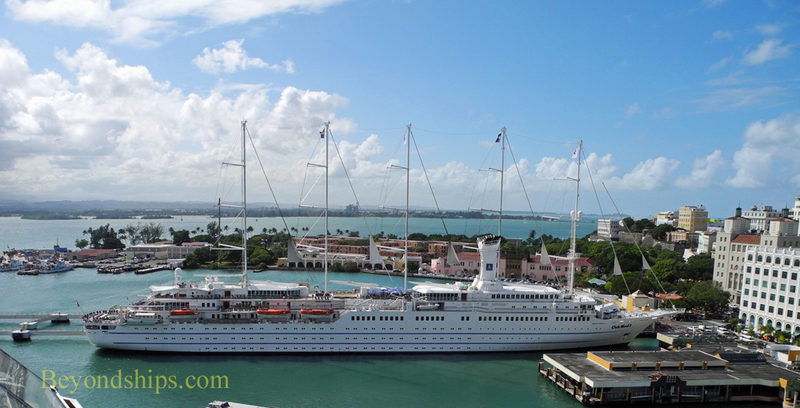 San Juan is both a port of call on cruises originating elsewhere and a port of embarkation for cruises. Consequently, it is not unusual to see several cruise ships in port on the same day during the winter season. 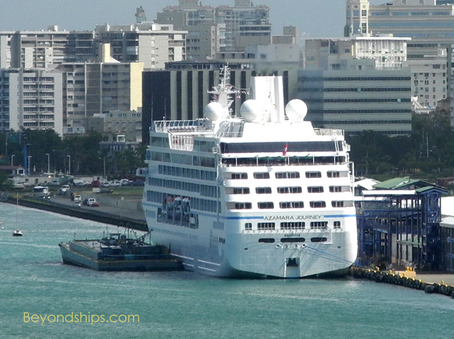 There are three places where cruise ships dock in San Juan. Most ships that are visiting San Juan for the day dock at one of three finger piers that face Old San Juan. Some cruises also begin here. These piers are along Calle Marina and the area is sometimes referred to as La Marina. Guests visiting the city for the day merely have to walk to the end of the pier to be in historic old San Juan. Thus, the historic sites, shopping, restaurants and bars of Old San Juan are within walking distance for most passengers. For those who prefer not to walk, there are always taxis waiting at the end of the pier. 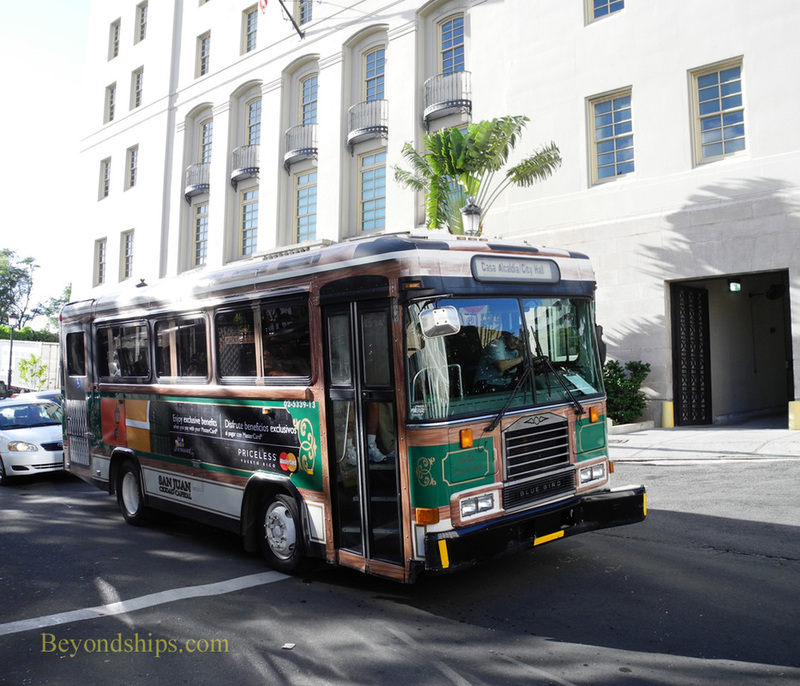 There are also tour buses and horse drawn carriages nearby that will take you around the city. 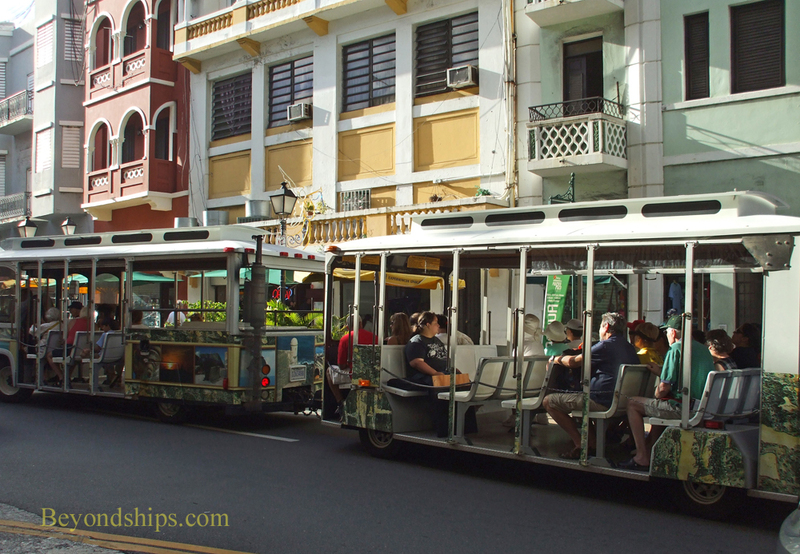 Another popular mode of transport is the free trolley that goes to many of the popular tourist attractions in Old San Juan. The Pan American cruise terminal is further up San Juan Bay and is near to the Isla Grande airport. Since it is on the other side of the bay from Old San Juan, it is not practical to attempt to walk from that terminal to Old San Juan. 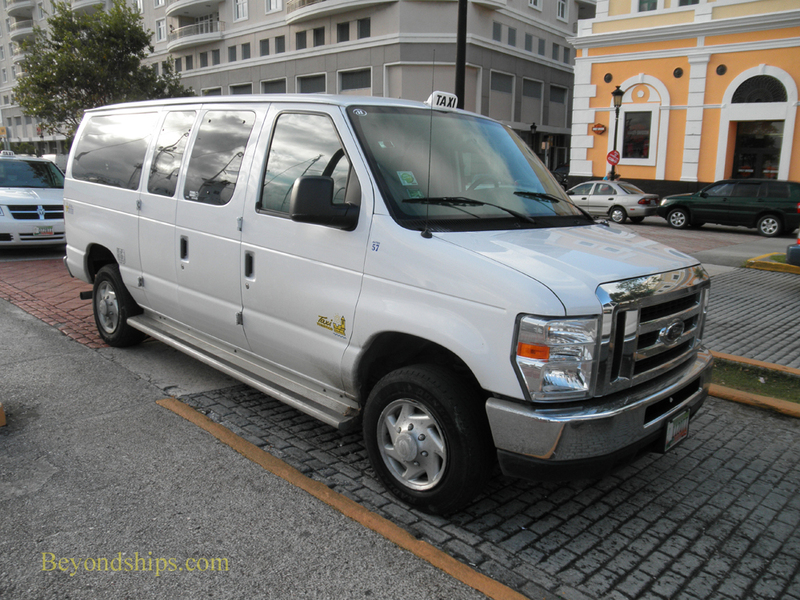 However, it is only a five to ten minute taxi ride from Old San Juan. 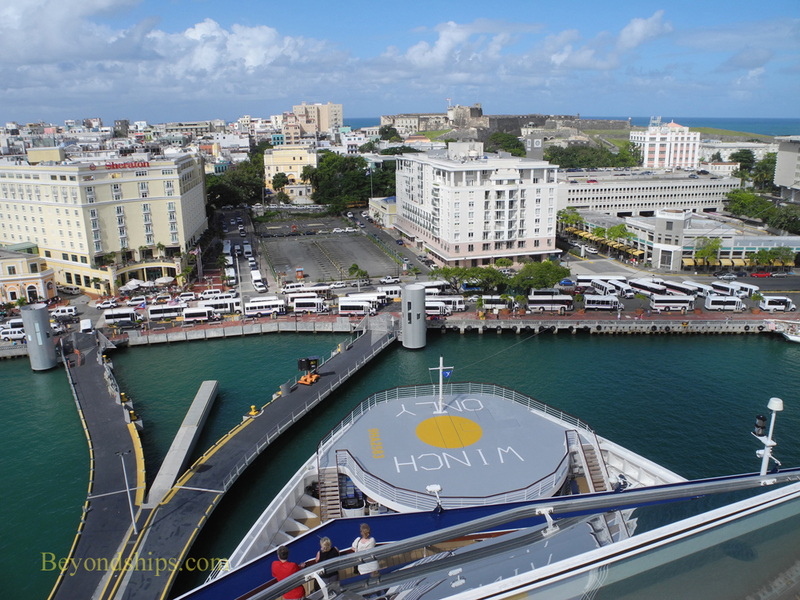 Most, but not all, cruises originating in San Juan leave from one of the two berths at the Pan Am pier. Another place where cruise ships sometimes dock is the Navy Frontier Pier on Fernandez Juncos Avenue. This pier is often used by cargo ships. 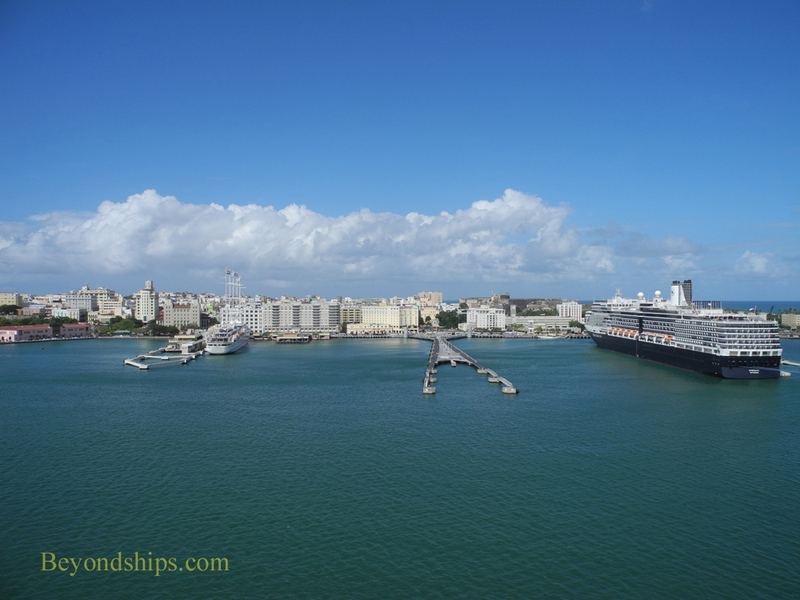 It is across the channel that separates the Pan Am pier from Old San Juan. While it is on the same side of the peninsula as Old San Juan, the tourist area is not within walking distance for most people. 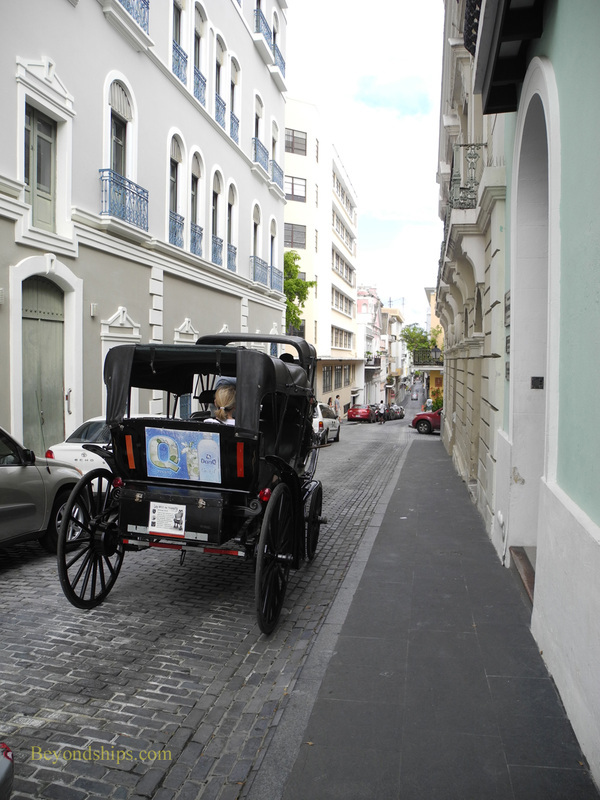 But, it is a short taxi ride to Old San Juan. Above: Club Med 2 at the piers in Old San Juan. 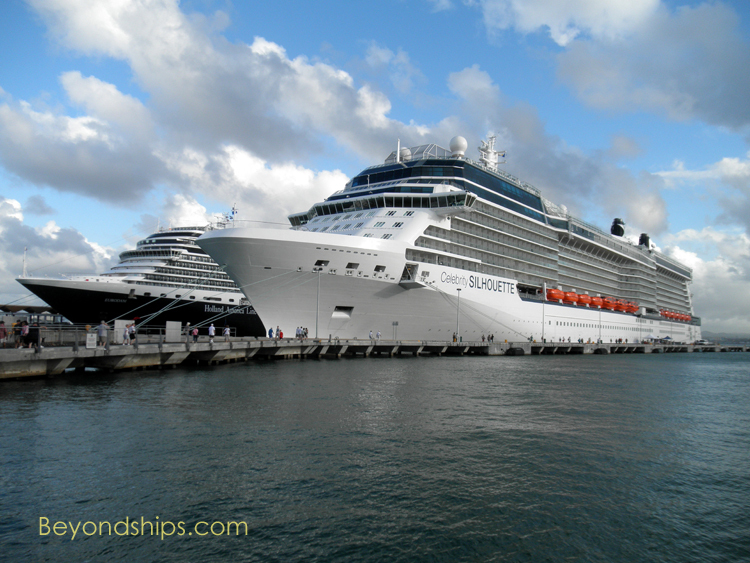 Above: Celebrity Silhouette and Eurodam in Old San Juan. 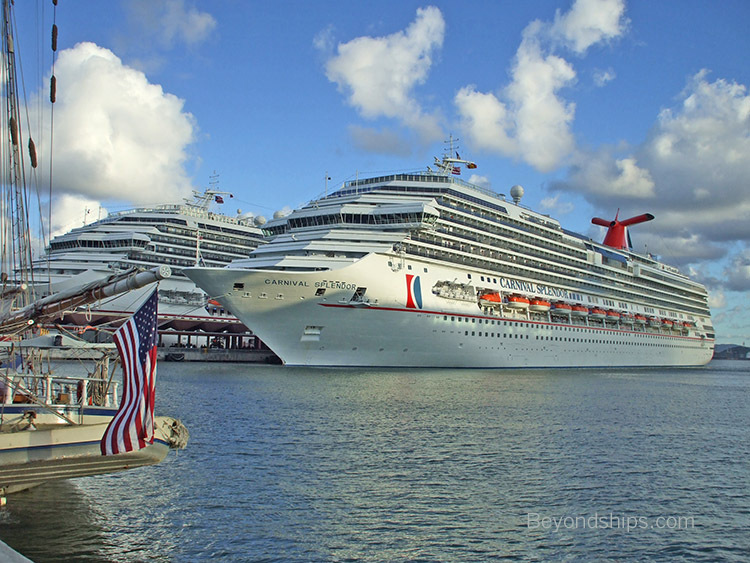 Below: Carnival Splendor and Carnival Freedom in Old San Juan.